CPI four-post racks offer the strength and stability of a cabinet in an open architecture. 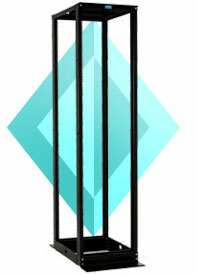 Four-post racks provide easy access to cabling and equipment and unrestricted airflow for ventilation. They also permit the addition of a wide variety of CPI vertical cabling sections. CPI manufactures two styles of fixed four-post frames and two styles of adjustable depth frames to best meet your mounting requirements. QuadraRack Frame or Cabinet System? The QuadraRack 4-Post Frame provides a sturdy, cost-effective solution for supporting large rack-mount communications equipment, such as routers and voice or network switches, in telecommunications and equipment rooms and other network facilities. The QuadraRack offers the strength and stability of an enclosure in an open mounting system that provides easy access to equipment and cabling. The QuadraRack 4-Post Frame will support up to 2000 lb of equipment. The corner posts are C-shaped equipment mounting channels that that are fixed 29" apart to provide front and rear support for 19" rack-mount equipment or shelves. The channels surround and protect equipment. Each rack-mount space is marked and numbered on the channels making it easy to locate and position equipment. Mounting holes are threaded allowing quick installation of equipment or shelves. Use to support large modular network or voice switches and routers in communications equipment rooms. Use with shelves to support large, heavy computer and data processing equipment. The QuadraRack Server Frame provides a sturdy, cost-effective solution for supporting rack-mount computer servers and data storage equipment in data centers, computer equipment rooms and other facilities. The QuadraRack offers the strength and stability of an enclosure in an open mounting system that provides easy access to equipment and cabling. The QuadraRack Server Frame will support up to 1,000 lb of equipment. The corner posts are C-shaped equipment mounting channels that that are fixed 29" apart to provide front and rear support for 19" rack-mount equipment or shelves. The channels surround and protect equipment. Each rack-mount space is marked on the channels making it easy to locate and position equipment. Mounting holes are square-punched allowing mounting hardware (cage nuts) to change to match equipment requirements. The QuadraRack Server Frame can be used in combination with CPI Standard Racks (two-post racks), Cabling Sections (vertical cable managers) and overhead Cable Runway (ladder rack) to support a wide range of equipment storage applications. You can attach 12" wide and 18" wide CPI Cable Runway (ladder rack) directly to the top pan with J-bolts or a Cable Runway Elevation Kit. CPI Cabling Sections bolt directly to the side of the frame, and the base of the frame is punched for easy floor attachment. 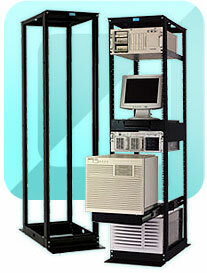 Use to support rack-mount server and data storage equipment in data centers or computer equipment rooms. The Adjustable ServerRack and the Adjustable QuadraRack provide a sturdy, cost-effective solution for supporting rack-mount network, computer server and data storage equipment in data centers, computer equipment rooms and other IT facilities. Both racks offer the strength and stability of an enclosure in an open four-post frame that provides easy access to equipment and cabling. Each rack will support up to 2,000 lb (907.2 kg) of equipment. The corner posts are C-shaped equipment mounting channels that provide front and rear support for 19" wide rack-mount equipment or shelves. The front and rear frames are welded to reduce assembly time. Four brackets connect the front and rear corners of the rack. 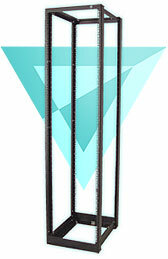 The rack is available in four heights and four depth ranges. The front-to-rear depth of the mounting channels can be adjusted up to 5.91" (150 mm) in depth in .98" (25 mm) increments during assembly. The mounting channels are fixed in place once assembled to surround and protect equipment. 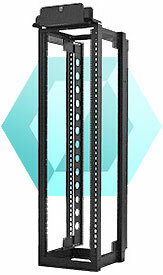 The Adjustable ServerRack has square-punched holes that let you change mounting hardware (cage nuts) to match specific computer server and data storage equipment mounting requirements. The Adjustable QuadraRack has threaded mounting holes that make installation time of patch panels, fiber enclosures and network switches shorter. Each RMU is marked and numbered on the channels making it easy to locate and position equipment. A second set of holes along the sides of the channels lets you add optional side-mounted Equipment Support Rails that use no additional RMU space. The Adjustable ServerRack and the Adjustable QuadraRack can be used in combination with CPI Standard Racks (two-post racks), Cabling Sections (vertical cable managers) and overhead Cable Runway (ladder rack) to support a wide range of equipment storage applications. Attach 6" (150 mm) wide to 24" (600 mm) wide CPI Cable Runway to the top of the rack with a Cable Runway Mounting Bracket. CPI Cabling Sections bolt directly to the side of the channels, and the base of the rack is punched for easy floor attachment. The Adjustable Rail QuadraRack (ARQR) and the Adjustable Rail ServerRack (ARSR) provide a sturdy, feature rich solution for supporting rack-mount network, computer server and data storage equipment in data centers, computer equipment rooms and other IT facilities. Both racks offer the strength and stability of an enclosure in an open four-post mounting system that provides easy access to equipment and cabling. The front and rear frames are welded to speed assembly and increase strength. Four brackets connect the front and rear corners of the frames. Front mounting rails attach to the front frame in a fixed position and align with the front of the rack or can be reversed for recessed mounting to maximize side-to-side airflow through network switches. Rear mounting rails can be adjusted in depth even after the rack has been bolted to the floor and can be extended beyond the rear of the frame by 6" (150 mm). A second set of holes along the sides of the frame lets you add optional side-mounted equipment support rails and vertical power strips that are independent of the mounting rails and use no RMU space. The bottom of the rack is punched for easy floor attachment. Each rack will support up to 2,204 lb (1000 kg) of equipment. The Adjustable Rail ServerRack has square-punched mounting rails that let you change mounting hardware (cage nuts) to match specific computer server and data storage equipment mounting requirements. The Adjustable Rail QuadraRack has threaded mounting holes that speed installation of patch panels, fiber enclosures and network switches. Each RMU is marked and numbered on the front pair of mounting rails making it easy to locate and position equipment. 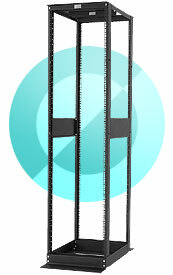 The front pair of mounting rails may be mounted to allow RMU numbering to start at the top or bottom of the rack. Each rack is available in three heights and two depths and includes a Top-Mount Cable Waterfall Tray with adjustable radius drops to allow easy side-to-side routing for patch cords. Use with any CPI cabling section (vertical cable manager) or Cable Guide Kits to organize cables along the sides of the rack. Attach CPI Cable Runway to the top of the rack with J-Bolts, a Cable Runway Elevation Kit or a Cable Runway Mounting Bracket to support overhead premise cables. A side panel option is also available and can be mounted to CPI’s vertical cable management products. X=Color; 1=Gray, 2=White, 7=black. Rails are 19”EIA. Minimum Rail Depth is 15.00” (380 mm).